I tried it a second time, with better results. Olive oil on the bread first, top and bottom. Chicken thighs with bones and skin. I overcooked it a bit and the exposed bread got over toasty, but still flavourful. Chicken was excellent: skin tight as a drum. I think maybe our Canadian chickens are a bit leaner than the usual American chickens, which results in a bit less fat. Hence, needs more olive oil. PS. Gary, do you have a spatchcocked turkey recipe?? Geo wrote: PS. Gary, do you have a spatchcocked turkey recipe?? I don't spatchcock turkey, I use a backbone out method which results in the turkey....Here, let me link below to to older LTH threads that explain it well. Low & Slow 2 has a detailed turkey method. Its geared for the smoker but easily adaptable to oven. Tnx Gary, looks good. Question: when you dislocate the joint by grabbing leg in one hand and thigh in the other, you're talking about dislocating the 'knee' and not the 'hip', right? Geo wrote: you're talking about dislocating the 'knee' and not the 'hip', right? Did someone say spatchcocked? I used this spatchcocked turkey recipe from Kenji at Serious Eats last year and it was fantastic. So I'm doing it again this year, again with Kenji's salt-baking powder dry brine. I can't recommend it enough, assuming you're planning on doing roast turkey. BR wrote: Did someone say spatchcocked? I used this spatchcocked turkey recipe from Kenji at Serious Eats last year and it was fantastic. So I'm doing it again this year, again with Kenji's salt-baking powder dry brine. I can't recommend it enough, assuming you're planning on doing roast turkey. Exactly what I'm doing, over slightly stale bread from Hewn. In reality, it's probably not all that different from laying what many call "stuffing" under the bird. Good idea nr706 and BR! I'm planning to kenji spatchcock for the first time this year. But my wife was sad about no in-bird stuffing. I think you've solved that issue nicely. Will you wet the bread prior to laying it down? spices, herbs? Make stuffing/dressing waffles and put them under the bird--We're doing individual Cornish hens this year with roasted turkey on the side for those who insist on tradition. I worry about losing some of the crispness of the skin with wet stuffing underneath - would the bird steam instead of roast? Geo wrote: Good idea nr706 and BR! I'm planning to kenji spatchcock for the first time this year. But my wife was sad about no in-bird stuffing. I think you've solved that issue nicely. Will you wet the bread prior to laying it down? spices, herbs? I don't think wetting the bread would accomplish anything - in fact, it might be counter-productive, because the whole point is for the bread to absorb the drippings from the bird. I doubt wet bread would absorb more liquids well. But I probably will rub the slices of baguette with garlic. Good point nr706. Do you slice your baguette by latitude or longitude? A little olive oil on the bread is essential. Geo wrote: Good point nr706. Do you slice your baguette by latitude or longitude? Was going to make chicken bread but the Bride called while I was at the grocery and said she had a cold. 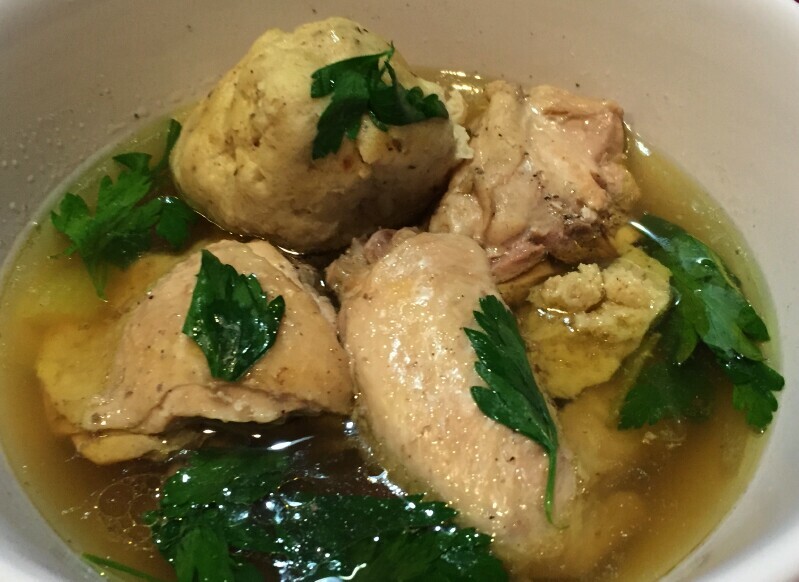 Mid-stream switch to chicken soup w/matzo balls. This is my bowl , I like big pieces with bone/skin. Skin-off, no bone shredded chicken for my ever so demure better half. Chicken bread frenzy has spread across our nation. Okay, perhaps I'm ahead of myself here. But perusing pictures of Bar Marta on Yelp, I couldn't help but notice a photograph of what appears to be chicken bread, listed as roasted chicken with fry bread on the menu. a spatchcocked whole chicken, some onion and garlic and olive oil. 90 min at 425 convection. such a winner- the family went wild. definitely going into dinner rotation. Although boneless thighs would also be awesome. I think you need the chicken skin for this to work. I'm going to try it tonight over leftover sabzi polow (home made persian style herbed rice) instead of bread. Will report back. I've made chicken bread several times with the simplest and best ingredients and we've loved it. Now I'm thinking about flavor profiles for a marinade and whether the extra deliciousness in the chicken would be canceled out by a loss of the simple schmaltz flavor of the bread. Ideas? Chicken Bread, meet Chicken Salt. Place the chicken skins on a baking sheet and roast until golden, about 25 minutes. Strain off the rendered chicken fat. And how can you not now eat those skins? I would never make it to the salt part of the recipe. I'll be making this tonight. I'm going to toss a small handful of grape tomatoes in amongst the chicken, hopefully their lower water content will make for a good combo when they blister and burst. No pics but a few grape tomatoes tossed in olive oil s&p made a wonderful addition to the dish. Any bread less than 3/4" seems to not be able to hold up the juice and rendered fat onslaught. Just a great simple delicious recipe, easy to pair sides with and tasty. Winner. So I tried a new variation of chicken bread. Last time I made this, it was with thick slices of garlic bread and chicken thighs. This time I went with split English muffins and chicken legs at 410 for about 50 minutes. During the last 10 minutes or so, I added some sweet chili bbq sauce to the legs. My kids thought the muffins looked weird but they really tasted wonderful. The sides that were in contact with the pan developed a nice crunchy exterior and the insides were moist from the chicken fat and olive oil. Sides were sauteed purple cabbage and garlic rice pilaf. Another chicken dinner winner. Keeping the cold at bay with Chicken Bread! Chicken Bread, Count me a Fan! The May/June 2018 issue of Cooks Illustrated has what amounts to a recipe for Chicken Bread in it. They start with trying to duplicate the Zuni Cafe chicken recipe and end up with chicken bread. They turn the bread into a salad, but I say who needs those icky veggies when you've got chicken bread? Watched Todd Harris of Steingold's demo root veg latkes on WGN TV Lunchbreak. Looked tasty so I made it for dinner with Chicken Bread. Crispy and delicious, two of my favorite words. Chicken Bread & Latkes, Count me a Fan! It's chicken bread time of the year again ( I just don't think of it in summer). Made it Saturday night and it was as good as always.